It's the most wonderful time of the year! As 2018 comes to a close, enjoy Hamlet Hub's Holiday Highlights. Discover a variety of things to do, people to see, places to visit and food to eat! 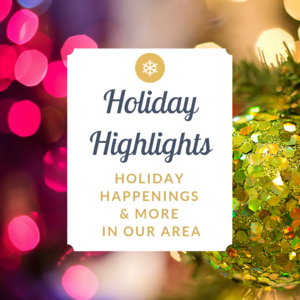 Below is a listing of the amazing featured businesses, organizations and events that are offered in our neighborhood. Celebrate the season with your friends and family. Schech's Hot Tubs for the Holidays! Schech's Pool Spa Patio is Putnam County's first pool and spa store! We have 50 years of experience helping our customers create their dream patios! Shopping for the holidays can be exhausting. Shopping for a new hot tub from Schech's is the perfect gift for the whole family that will provide endless hours of relaxation and family fun! I am a Disney Destinations Specialist. I help plan and book all Disney vacations, including Walt Disney World, Disneyland, Disney Cruise Line, Aulani in Hawaii, and Adventures by Disney. I will work with you to create a customized vacation, that works for your family and your budget. Our agency also has many exclusive rates that are lower than the Disney rack rates. I will monitor new Disney discounts, to make sure you pay the lowest possible price for your Disney vacation. Best of all, my personalized planning services are COMPLIMENTARY! Its finally time to prepare your estate plan – is a will or a trust your best option? Are your assets protected if you need to go into a nursing home? $12,428.00 – monthly Medicaid regional rate for Westchester private pay residents. You must pay five years before it’s free! Advanced planning can protect your assets from nursing home liens against your home and property. Age at home! You can also receive government assistance from a home healthcare aide in as little as 30 days! This holiday season, give a gift that truly can change lives - a gift certificate with the personal touch truly shows you care. It is my passion to share what Shaklee products can do for you and those you love. I invite you to easy online shopping on the Gifts of Shaklee.. The Hudson Valley’s Premier DWI Defense, Veteran Assistance, and Estate Planning Firm. Established by a Service Connected Disabled Combat Veteran of the Global War on Terrorism and Former Assistant District Attorney in Putnam and Bronx Counties to provide thorough, detailed, and cost-effective representation with compassion and dignity for our clients. I am local. My business is to increase your net bottom line and Grow your business by at least 5% year over year. First, by eliminating all those junk fees on your Credit card Merchant Statement. Second, by utilizing our Customer Engagement platform to provide value and increased awareness of your business with your customers. There are no contracts.So I earn your business every month. The analysis is free. Most often, the upfront to being is just for FEDEX, depending on your business needs, of course. SOPHIA is hosting "Acupuncture Happy Hour" every Tuesday evening from 5:00 - 7:00 pm. Receive a relaxing 20-minute stress reduction treatment using gentle ear acupuncture or acupressure techniques. Cost: $10 per treatment. Military Veterans are FREE! (with a military ID card or DD-214). All proceeds donated to charity! Whether you're looking for Cold Cuts,Wedges, Hot foods or Desserts, Cheff's has you covered.We offer catering for all your events, family, corporate or any other occasion. Call us @ 845-200-7643 or visit us at 13 Fair St. Carmel ,N.Y. Happy Holidays from Aversano's! Book your holiday party or catering orders now! Complete party set up - We bring everything. Aversano's Gift Cards are the perfect gift for everyone on your list. Redeemable in the restaurant, bar, and pizzeria. Our Limited Edition Holiday Products make a great gift for yourself or for those that you care about! Pure, Safe, and Beneficial for the entire family. Are you looking for the perfect gifts for everyone on your holiday list? Jar Worthy has something for everyone. Candle gift sets, lotions, jewelry and stocking stuffers! Let us customize your holiday candles with your favorite picture or business logo! Unwined Wine Bar & Kitchen is co-owned by long time local Westchester residents, Stephanie Small of Waccabuc & Brian Moss of Somers. The pair, who also opened Uncorked Wine & Spirits next door to Unwined three years ago, teamed up to create a totally unique space and dining/bar scene unlike anything else in Westchester County. The result is an extensive and varied menu, fabulous bar scene, over 30 interesting wines by the glass to choose from, an event space for private & special events all housed in a modern and stylish space with many different seating options to suit customers mood or preferences. UnWined is open 7 days a week for dinner beginning at 3pm and serves Sunday Brunch 11-4. Thinking about a Christmas gift idea for someone you love this year ? Well, Brewster Shell has you covered. Gift someone a VIP membership. A yearly package valued at over $500 includes inspection, fluid changes, towing and more for only $300.00 Give us a call ask for Kim or Barb and we will get your Christmas shopping started today. Remember all the wonderful Holiday Variety shows we all grew up on in The 70’s & 80’s? Now is your chance to see them live and re-created by Las Vegas’ number one impersonators of all time. All your favorite legendary Superstars come alive in Christmas with The Stars. The NBC Today show says “it’s one of the most extraordinary shows we have ever seen.” Sonny & Cher, Neil Diamond, Johnny Mathis, Rod Stewart, Bette Midler, Barbra Streisand, Andrea Bocelli, Tom Jones, and many many more all in one show. All live vocals. Seasoned, hardwood firewood for sale while supplies last! Call for delivery and details (845) 878-7888. Six Diamonds provides reliable, professional and quality tree services including take down and removal, trimming/pruning, land clearing, stump grinding and landscaping. Fully licensed and insured. We work all year long! On Saturday, November 24, New Farifield held their annual event. Click here to read more about it. The Southeast Museum held the annual Holiday Caroling and Tree Lighting event on Saturday December 1 at 5:15pm. Click here to read more about it. On Saturday, December 1 2018 The Hamlet of Carmel Civic Association held their annual event. Click here to read more about it. The Town Of Somers held their Sixth Annual Town Menorah Lighting at the Elephant Hotel on Route 100 and Route 202 Opposite Bailey Park on Sunday, December 2, 2018 at 6PM. The Annual Town of Somers tradition to take a photo of your children in front of the town Christmas tree with a 6 foot ruler watch your children and the trees grow each year. Photo may also be taken with the ruler by appointment during town office hours, call 914. 277. 3637. Click here for photos and more information about the event. Stories and Songs with Miss Lynn! Cupcake Decorating for Kids in Grades 3-5! Saturday, Nov. 24, 12:30-3:30 pm. HamletHub is a FREE community resource. Sign up for our nightly newsletter for your town!